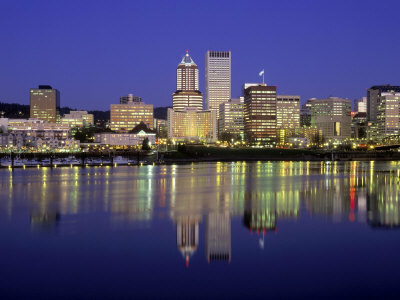 Portland Oregon real estate claims residence in one of the greenest, if not the greenest city in the nation. This is a welcome breath of fresh air for the 582,130 Portlanders who take pride in the stunning skyline of bridges, parks and skyscrappers. Only the 30th most populous city in the US, Portland Oregon real estate is a well kept secret that allows for small community friendliness with all the opportunities of a bustling city. Portland Oregon real estate is saturated in art, restaurants, live entertainment, the best coffee, and all manner of shopping discoveries. Pioneer Place fills four city blocks with the finest shopping experience or you can window shop as you skate at the ice rink at Loyd Shopping Center. For book enthusiast, don't forget to pick up a map before entering Powell's Books, arguably the most dizzying and monolithic used bookstore in the nation. Portland's individual neighborhoods hold some of the best shopping and dinning treasures, whether it's the clothing botiques on Northeast Alberta, delicious Dim Sum in Chinatown, quirky art in Southeast Portland, or great microbrews in the Pearl District. Rivers, parks, mountains, lakes, and forests allow Portland Oregon real estate buyers to have unprecidented access to the outdoors. Even within city limits, Portland is host to numerous bike paths, trails and stretches of grass. For extra company, join one of hundreds of community groups that take advantage of Portland's green reputation. Forest Park alone is the largest wilderness park within city limits in the United States, covering more than 5,000 acres. And the Oregon Zoo’s exotic animals will have you have you wondering whether you ever need to leave the city at all. Even rainy days allow for quality time at the Oregon Museum of Science and Industry, or one of the many museums in the Cultural District. Every neighborhood is busting with it's own personality. Whether you crave the sweeping city and mountain views from Mount Tabor, Multnomah Village's small town feeling, Northeast Portland’s tree-lined urban streets, or even living near a castle in the West Hills, Portland Oregon real estate has it all. And then some. With approximately 47,000 students in 85 schools, Portland is the largest school district in the Pacific Northwest. For more information on the Portland School district, visit their website: www.pps.k12.or.us/. Portland Oregon real estate also has access to the world-class teaching hospital and research center, OHSU along with a host of other accredited hospitals in the area. For a list of all medical fascilities: www.theagapecenter.com/Hospitals/ Oregon.htm. Contact The Rob Levy Team, your Portland Oregon real estate experts, Today!